"This was boyfriend borrowing, on the grand scale..."
As you may have noticed, I've been radio silent on fashion week collections since New York. That's partly just bad blogging, but partly disinterest. I hadn't heard of anything with that "wow" factor since NYFW. (Maybe I wasn't listening?) Anyway things have been a little nutty over on my end, which I'll explain soon. 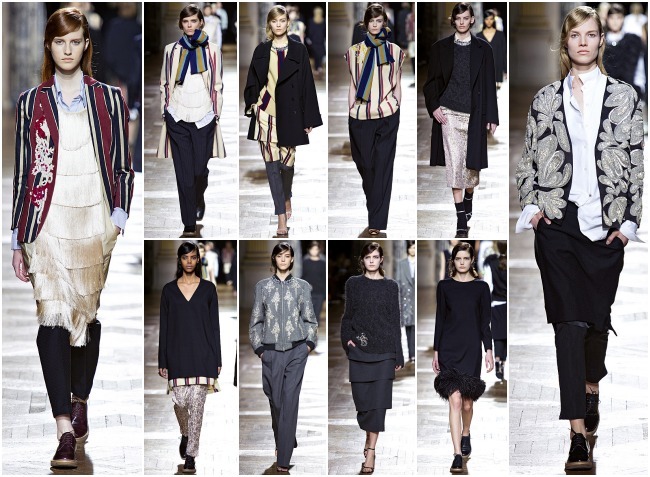 Back to this - Dries Van Noten, AW13. I am swooning, drooling, and fawning over this collection from behind my computer. It's suiting fabric and menswear silhouettes that got caught in a windstorm with some feminine touches and came out mixed up in the best way possible: wearable. As with many of my favorite collections for Fall '13, it's full of really good jackets. (See exhibits A and B on the far left and right.) I also love that almost all the models are in flats. (Creepers, no less!) The slouchy nature of the pieces combined with artful pattern mixing, interesting layering and more than a few unexpected details (appliques and feathers!) make this whole collection a slam dunk in my book. Do you like this offering from Dris Van Noten as much as I do?